Situated on the West side of the A169, South of Sleights and North of Lockton, the Hole of Horcum is a natural amphitheater, some three quarters of a mile across, and over four hundred feet deep. There is a fantastic vantage point with specially created viewing points where the A169 runs around the North Easter tip of the hole. From here, it is possible to see, as shown below, to the far Northern, Western and Southern sides of the hole, along with all the pathways and features that this area is famous for. Above. Looking South West across the Hole of Horcum. The floor of this immense feature, is littered with the earthwork remains of medieval and earlier enclosures, medieval dykes, ruined buildings, the remains of settlements, field systems and cairns. Above. A view of the bottom of the Hole of Horcum, showing the footpath running alongside Levisham Beck. 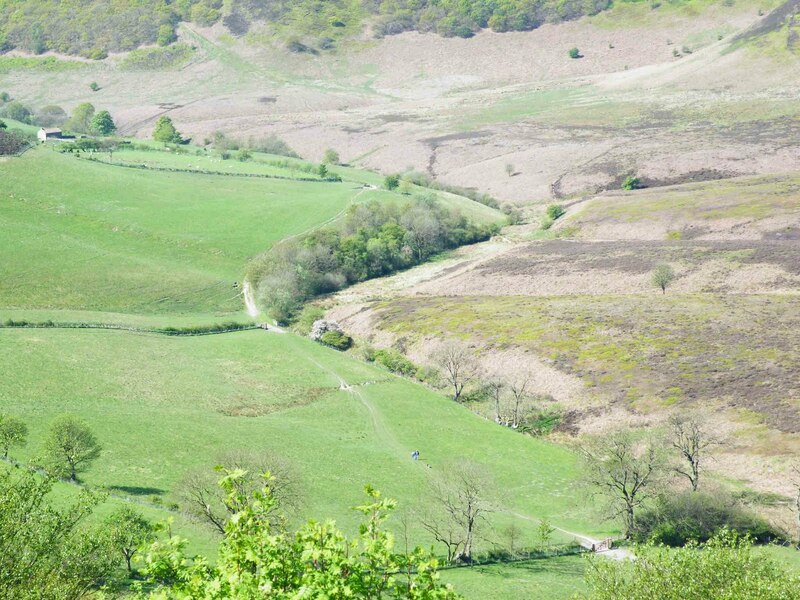 Follow this link for photos of a walk through the Hole of Horcum towards Skelton Tower. And more excellent photos here.